And to a certain extent, I am still far from being one. Although as a registered dietitian, I know a lot about the ingredients in said kitchen and can now usually whip up tasty plant-based meals in under 20 minutes. I find that the key to doing this successfully is having the right ingredients on hand. Below, I share the vegan grocery list I rely on to keep my kitchen stocked with the right ingredients at all times. Grocery shopping can be a time-consuming experience. Especially with kids in tow! So before I dive into the details of my ultimate vegan grocery list, I’d like to share a couple of pointers with you to help streamline the whole process. These tips should help you shop more efficiently and ultimately plan and cook cheaper, healthier meals in a shorter amount of time. Keep meals simple by avoiding ones that require too many ingredients or difficult to find ones. Instead, focus on family favorites that can be whipped up quickly. Lately, I’ve enjoyed experimenting with freestyle cooking — that is cooking without a recipe— which I find saves me loads of time. But if you prefer to use recipes, I strongly encourage you to select ones that use only less than five, easy to find ingredients with prep times under 20-30 minutes. There are plenty of websites you can use to get inspired, by my favorite for ultra quick yet tasty recipes is Minimalist Baker. You may have noticed this already, but fresh products tend to be displayed on the perimeter of the grocery store, while the more processed ones often find their spot on the aisles in the middle. If you aim to get most of the items on your grocery list from the perimeter, you’ll be much more likely to bring home nutrient-dense foods. And you’ll also likely bring fewer processed foods home, which can also contribute to a more nutritious diet! Taking the time to make a grocery list before hitting the supermarket is a time-saving must. If you like to cook based on recipes, I encourage you to draft your shopping list as soon as you pick the recipes you want to make that week. Or if you prefer a freestyle cooking approach like I do, simply write the amounts you need for each category— for instance, 8 portions of vegetables — and pick the types that speak to you the most at the grocery store. I find that shopping with a list also tends to help reduce the amount of food waste. Many of my clients are initially resistant to meal planning because they feel this will stifle their creativity in the kitchen. But having a list of meals that you’re looking forward to eating that week can greatly reduce the amount of time you spend in the kitchen. Meal planning is also an easy way to ensure you consume a variety of vitamins, minerals and beneficial plant compounds. I personally like to build my meals based on the “healthy plate” method, including a source of protein, starch, fat, fruit or vegetables at each meal. Keeping your supermarket layout in mind when making your shopping list can help you save tons of time. This will help reduce that going back and forth between the different grocery store sections, ultimately saving you time. 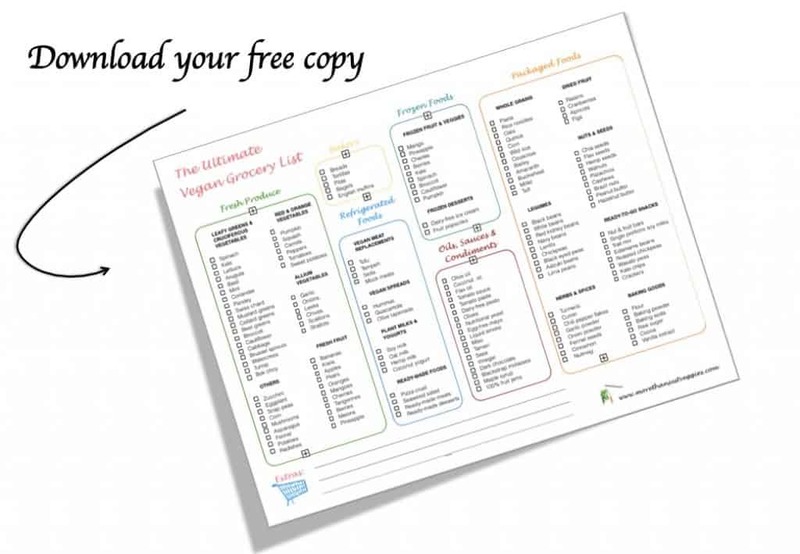 You’ll notice I’ve organized my own shopping list in this manner — which you can download for free below — to help give you an idea on how you can use this tip when making your own vegan grocery list. I always aim to purchase the largest package of non-perishable (or slowly-perishable) items such as beans, grains, frozen fruit, nuts, seeds or condiments that will fit in my pantry or fridge. This helps me stay on budget and also helps reduce the amount of plastic waste I contribute to. Plus, having to refill my bulk containers only every few months rather than every few weeks helps minimize the time I spend at the grocery store. Learning how to read labels more efficiently can help you make healthy choices at the grocery store more quickly. As a general rule, I try to pick items with the shortest ingredients list. It’s good to know that ingredients are listed in decreasing order based on the amounts found in the food. So I like to make sure that the ingredients that are listed on the label fit my expectations. For instance, I’d expect to see a (whole) grain rather than sugar as the first ingredient on a box of cereal, and will pick my cereals accordingly. This might seem like a funny tip to add to the list. However, looking for that one spice that you’ve never heard of to make that one recipe you might never again make can definitely slow you down at the grocery store. Without mentioning the extra clutter this can create in your spice cabinet. For these reasons, I encourage you to simplify your shopping and cooking experience by sticking to recipes that require only a handful of spices and dried herbs you really enjoy using. All you’ll have left to do is refill those containers when they get used up. 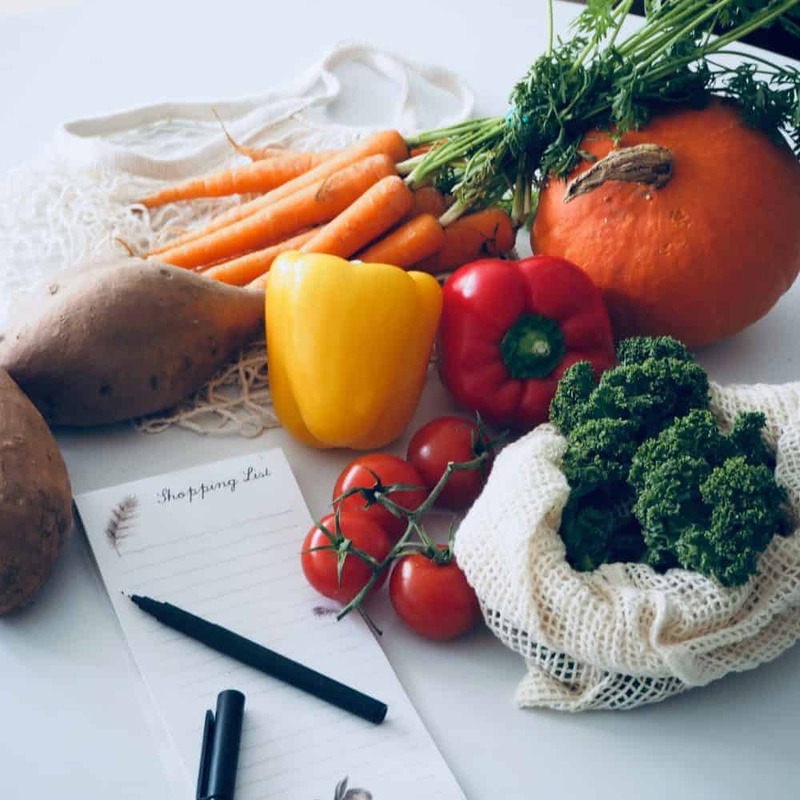 In sum Following the eight tips above should help simplify your grocery shopping experience, while helping you cook nutritious meals for the whole family without spending hours in the kitchen. 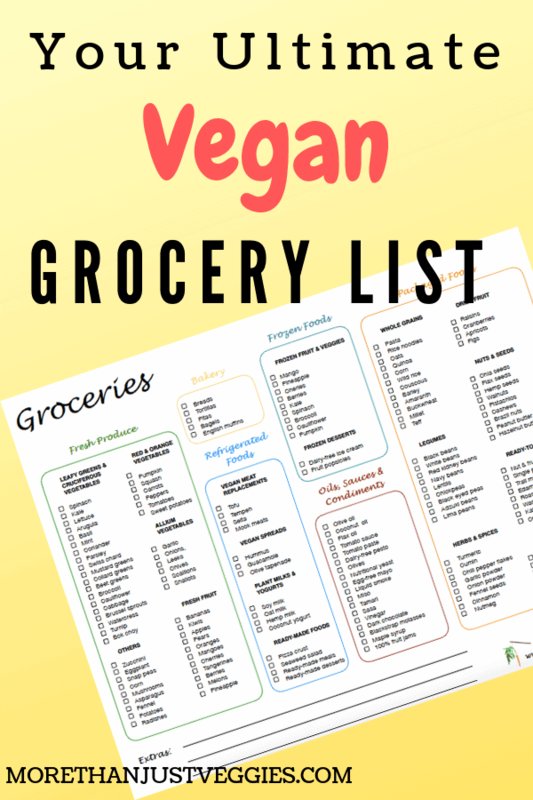 Although there is no one way to build the ultimate vegan grocery list, the list below is a good place to start. This is the list I personally rely on to keep my refrigerator, freezer and vegan pantry stacked with the ingredients I need to make quick yet nutritious meals in a matter of minutes. Here’s a visual overview of what you’ll find in my vegan kitchen! When it comes to fresh fruits and vegetables, variety is key. There are a couple of staples that I rely on week to week but I always supplement them with what speaks to me on my supermarket runs. Leafy greens: Leafy greens are consistently linked to a lower risk of chronic disease. So I keep my kitchen stocked with kale, spinach and lettuce, basil and mint, because these are the easiest to find where I live. But Swiss chard, mustard or collard greens are a few other great options (1, 2, 3). Cruciferous vegetables: This group of veggies is rich in sulforaphane, a beneficial plant compound that may offer some protection against type 2 diabetes, heart disease and perhaps even certain forms of cancer. I like to rotate between broccoli, arugula, red cabbage, cauliflower and kale. (1, 4, 5, 6). Red or orange vegetables: These tend to be rich in carotenoids, a type of antioxidants linked to eye, brain and heart health. The ones I like to keep on hand are bell peppers, tomatoes, carrots, squash and sweet potatoes (7). Allium vegetables: For instance, garlic, red and yellow onions. This category of vegetables not only adds flavor, but also contain potent compounds that may lower “bad” LDL cholesterol levels and may help fight off colds, although more research is needed to confirm this last benefit (8, 9, 10). Other vegetables: I’m a huge proponent of variety. This is why I supplement my staple vegetables with a whichever additional ones inspire me that week. I may alternate between asparagus, snap peas, eggplant, zucchini, corn or mushrooms. Fresh fruit: You’ll generally find bananas, dates, avocados, lemons and limes on my kitchen counter. In the summer and autumn, I also gravitate towards fresh melons, mango, pomegranate, berries, apples and pears. In the winter, I tend prefer oranges and tangerines. When it comes to baked goods, I strongly encourage you to pick ones made from whole rather than processed grains, as these tend to be richer in fiber, vitamins and minerals. However, I realize that depending on where you live, selecting whole grain products may not always be an easy feat. For instance, I find that whole grain vegan breads are more difficult to find now that I live in the Netherlands compared to back when I lived in Canada. As a rule of thumb, I try to select breads, tortillas, pitas and crackers that list a “whole” grain as the first ingredient whenever possible. Sourdough and Ezekiel breads made from whole grains are especially nourishing options. But don’t be fooled by the color of a bread — just because it’s darker in color or labelled as “multigrain” doesn’t necessarily mean it is made from whole grains. So make sure to check the ingredients. In sum Baked goods made from whole grains will offer you more fiber, vitamins and minerals. Make sure to check ingredient labels and try picking whole over processed grains whenever possible. This section is where you are most likely to find high-protein or high-calcium replacements to milk and dairy. I strongly encourage you to pick minimally-processed varieties low in added sugar, salt or fats. Vegan meat replacements: I prefer tofu and tempeh but my partner is a fan of mock meats. So you’ll likely find both in grocery cart or fridge. I try to select options with the shortest ingredient list and offering the most protein and lowest amount of added fat per portion. Vegan spreads: I’m a fan of hummus, guacamole and olive tapenade so I try to keep at least one of these options in my refrigerator at all times. I try to stick to low-sodium varieties without any added sugar. Plant milks and yogurts: My favorites are soy and oat milks as well as soy or coconut yogurts. I pick varieties fortified with calcium and vitamin D whenever possible. Others: From time to time, I’ll add a vegan pizza crust, edamame beans, a fresh seaweed salad, vegan dumplings or a ready-made plant-based meal or vegan dessert to the mix. In sum It’s best to select high-protein, low-fat meat replacements and calcium-fortified plant milks or yogurts that are low in added sodium and sugar. Frozen foods tend to get a bad rap. Although this reputation is likely well-deserved when it comes to processed foods such as pizza and chicken-less nuggets, not all frozen foods are made equal. For instance, when it comes to fresh produce like fruits and vegetables, frozen foods can be just as nutritious than their fresh counterparts (11, 12, 13). Frozen fruit: I stash my freezer with frozen mango, cherries and a variety of berries all year round. They’re a cheap way to eat these nutrient-rich fruit in the dead of winter. Frozen veggies: I keep frozen spinach or kale on hand to add to my smoothies and frozen pumpkin and broccoli for soups. Vegan desserts: When I feel like satisfying my sweet tooth, I’ll add the occasional dairy-free Ben & Jerry’s, coconut ice cream or fruit popsicles to my shopping list. In sum Frozen fruits and vegetables are great to have on hand when in a pinch. They’re also an easy and cheap way to consume nutrient-rich foods all year round. This section includes foods like whole grains and legumes that make the bulk of my meals. They tend to keep for a long time. So I encourage you to buy them in bulk if you are on a budget or want to reduce your environmental impact. Whole grains: My favorites are oats, quinoa, corn, whole wheat pasta, wild rice, couscous and barley. These are rich in fiber, complex carbs, B-vitamins, zinc, iron and magnesium (14). Legumes: Beans, peas and lentils are a great source of protein on a vegan diet. My favorite are black, white and red kidney beans as well as red and black lentils. Baking goods: Homemade pancakes are a weekend staple in my house. So I always keep whole wheat and white flours, baking soda, baking powder, raw sugar, cocoa and vanilla extract on hand. Dried fruit: Dried fruit is a handy addition to my grab-and-go snacks. I like mulberries, raisins and cranberries and try to pick varieties without added oil or sugar whenever possible. Nuts and seeds: These are a great source of fiber, protein and healthy fats. I always keep chia, flax, hemp and sesame seeds stocked and also rotate between walnuts, pistachios, cashews, pecans and brazil nuts. Keep them in the refrigerator or freezer for longer-lasting freshness. Nut butters: Nut butters are a great way to get the nutrition from nuts in a different form. It’s best to pick 100% natural butters — free of added salt and oils — whenever possible. Ready-to-go vegan snacks: When I don’t have time to make my own snacks, I rely on nut and fruit bars, single portions of soy milks, nut butters or edamame beans, roasted chickpeas, rice crackers, wasabi peas and kale chips to keep me fuelled between meals. In sum Vegan packaged foods are staples that can be easily incorporated into meals or snacks. Buy them in bulk whenever possible. Oils, condiments and sauces help add flavor to your meals. But when it comes to health, it’s best to pick options that are low in added sugars and salt and keep a light hand when using them. Oils: I generally keep olive, coconut and sesame oil on hand, but there are various other great options. Here is a great resource to help you figure out which plant oils to choose. Vegan condiments and sauces: I keep tomato sauce, coconut flakes, vegan pesto, olives, nutritional yeast, vegan mayo, liquid smoke, miso, tamari, salsa, balsamic and apple cider vinegars on hand. Sweets: I look for dark chocolate, blackstrap molasses, maple syrup as well as appelstroop, hagelslag, licorice and vegan stroopwaffels — for a little piece of dutch influence in my home! Herbs and spices: My favorite are turmeric, cumin, ginger, cloves and chilli pepper flakes. I also keep some fennel seeds on hand to help reduce the odd bloating episode. In sum Oils, condiments and sauces help add flavor to your meals. It’s best to select options low in added salt or sugar whenever possible and use a light hand when adding them to meals. Keeping your kitchen stocked with the right vegan grocery essentials makes it much easier to whip up quick and nutritious vegan meals and snacks. Here are a few of my personal favorites you can use for inspiration. In sum Stocking your kitchen with your own favorite vegan grocery essentials will help you make quick, nutritious and easy vegan meals and snacks. Building an amazing vegan grocery list is the first step to making nutritious and easy vegan recipes. The tips above should help you shop more efficiently and ultimately plan and cook cheaper, healthier vegan meals in a shorter amount of time. To get you started, I’ve created a free printable version of my go-to grocery list. Feel free to download it, print it, and use it to save time on your next grocery run!